← How Can You Call This LOVE? The word “Citizenship” seems to be a buzz word for both political parties and their speech writers. The point they are desperately trying to make is that Americans need to be good citizens if they wish to “change” the world. I fear that neither party really knows what good citizenship looks like, nor do they practice the principles of citizenship. HONOR – Student exhibits loyalty, respect, and trust towards others. LEADERSHIP—Promotes respect for authority, school policies, and property. Leads others to do the same. SERVICE—Accepts responsibility; shows initiative. Does things without being asked, that benefit others and not just self. PATRIOTISM – Exhibits love of country, city/town, school, and neighborhood. RESPECT – Does unto others as he/she would have done to them. Conscientious and thoughtful of others. 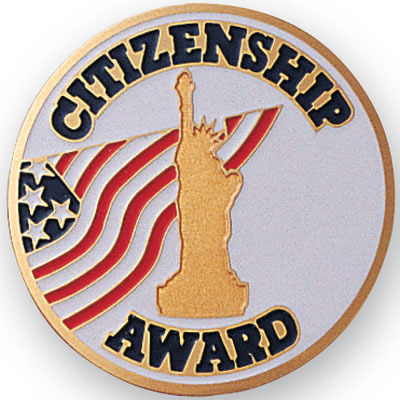 If I had to award our politicians, leaders, political parties, CEO’s, Bankers, and others who run our country with a Citizenship Award, I wonder if any of them could meet the criteria. When November rolls around and it is time for Americans to vote, I hope they will consider whether the person they will vote in for the job of president, senator, representative, etc. can meet the criteria elementary students must meet in order to be a good citizen. Our leaders should be the model that the citizens of the country follow. It will be interesting to see if they can live up to these high standards and “change” the world. Are You Qualified to be an American? Posted in Words of Wisdom and tagged Citizenship, Citizenship Award, courage, Democrat, good citizenship, Grandmother Musings, honor, Leadership, loyalty, November, Patriotism, Politicians, politics, postaday, President, Republican, Respect, Service, Voting. Bookmark the permalink. You sad it very well, Jamie. Sorry, typing too fast, I meant you said it very well. I hope you had a peaceful Sunday, Jamie. I worked like a mule to prepare my week, but it was a pleasant work. I listened to a lot of pleasant music and heard many inspirational talks. Super day! Thank you.